What do you think of when someone mentions the Jurassic or Cretaceous ages? Most likely you will immediately think of dinosaurs and other large reptiles such as pterosaurs. Maybe you think of the movie Jurassic Park, filled with dinosaurs and lush vegetation. This time has become known as the Age of the Reptiles and aptly so since many layers of the fossil record are loaded with animal bones belonging to reptiles. In rocks of marine origin, hundreds of sea reptiles (ichthyosaurs and plesiosaurs) have been found around in hundreds of locations globally. In rocks of terrestrial origin, dinosaurs and pterosaurs (flying reptiles) are found to the near exclusion of any other vertebrates. 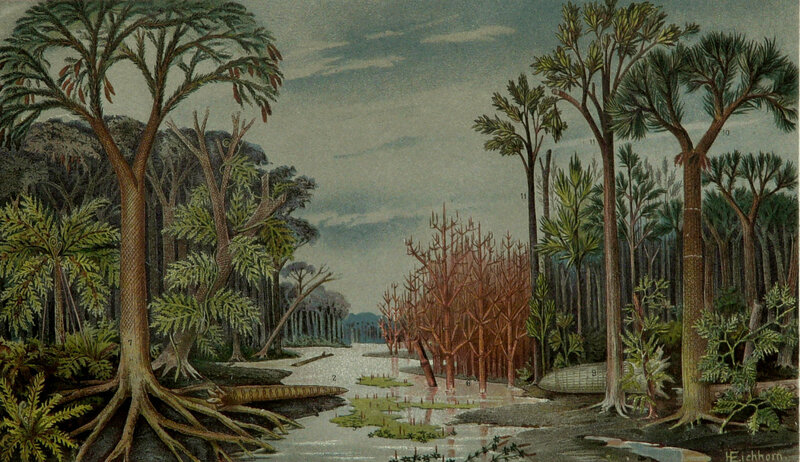 1800s lithograph (unknown source) of the flora of the Jurassic. Notice the lack of flowing plants. Most of these plant are extinct today. Also not the lack of grass which is a flowering plant but did not exist in the Jurassic. In addition to their bones, fossils of plants found in the same layers of rock revealed strange coniferous (pine-like) trees along with many cycads and tree ferns but no flowering plant trees at all! No oaks, maples, sycamores, etc.. have been found in these rocks. More significantly, no flowering plant tree remains have been found in the fossilized feces (coprolites) of plant-eating dinosaurs of the Triassic and Jurassic eras (see article: Dino Doo Doo (Coprolites) and the Genesis Flood). Some small flowering plants may have lived in the late Jurassic but they clearly did not make up any significant part of the flora since they were not part of the dinosaur diet. Whether you imagine these scenes from a book or a movie, a significant source of our views of the Age of the Reptiles traces itself back to the early 1800s and a woman who from childhood was fascinated with fossils. Mary Anning, (1799-1846) by the age of 12, had already discovered in rocks of the English countryside fossils that she would later describe as a plesiosaur. She spent more than 30 years collecting and describing fossils mostly in rock of Jurassic age. Anning along with William Buckland, who was well aware and an admirer of Mary’s work and described the first true dinosaur, and Cuvier, who described and wrote about dinosaurs, were instrumental in developing a picture of life in the Jurassic. Collectively, the discoveries of Anning and Buckland eventually lead to Cuvier’s specific proposal that there had been an “age of reptiles.” This “age” represented a time long ago when reptiles would have been the dominant animal in all places on earth versus the mammalian-dominated flora of today. Like the discovery of deep time itself over the previous century, this idea that the earth’s biota had changed over time presented a serious challenge to established views of the origin of biodiversity which was a form of creationism promoted by scriptural (or Mosaic) geologists. Google Inc paid homage to the 215 anniversary of the birth of Mary Anning on May 21 2014 with this Doodle on the homepage. 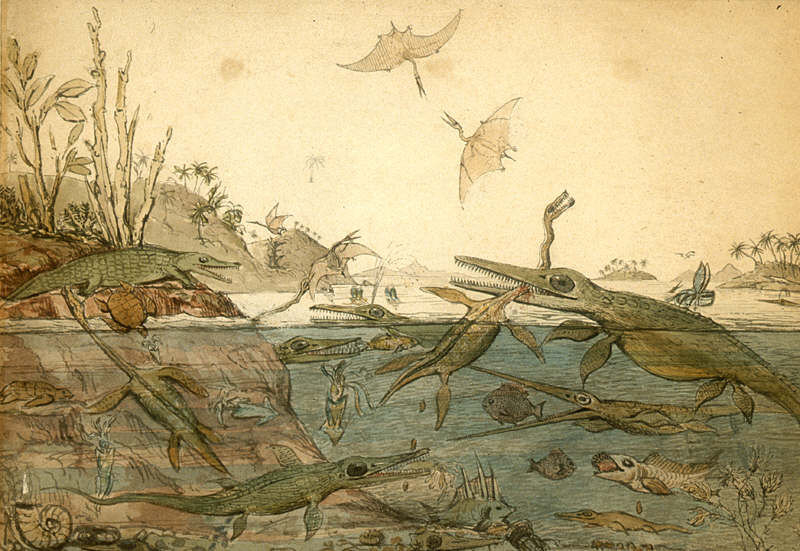 Image credit: Google Inc.
Below is a watercolor painted in 1830 showing a scene from the Jurassic time period. It was based on the fossils that Mary Anning had discovered and described. This is a truly amazing scene considering that we have made so many new discoveries since that time and yet the basic forms reptiles shown here are the same ones we recognize today. In many ways Cuvier’s proposal of an “age of reptiles” based on the work of Anning and Buckland and others capped off 100 years of advances in paleontology which led to the idea of “deep time” or the great age of the Earth. The fossil record was now increasingly seen as showing that not only was the earth very old but the fossils recorded time since the distant past show us life was very different from what we see today. This idea of changes in earth’s biota over time was yet another significant challenge to scriptural (Mosaic) geologists of the day and set the stage for even bigger challenges to follow. It was the recognition of the great changes of life from past to present that paved the way for Darwin and others to explore how those changes might have occurred. Before Darwin it wasn’t difficult to observe that organisms had changed or at least been replaced with different organisms throughout the history of the earth but what was the mechanism for that change? Darwin provided a possible mechanism with his theory of “natural selection.” Darwin is often given credit coming up with the idea of evolution but the idea that organisms were different in the past than the present was not novel to Darwin. Rather Darwin should be credited with providing a means to explain the observations that has already become well established idea in his time. « NH Notes: Biggest Dinosaur Ever Found But Is It The Largest Animal? You have a lot of nice articles here. I wish I had your productivity. I do have one question though. You state that no dinosaur coprolite has the remains of angiosperms. Are you specifically referring only to the Jurassic? Although i grant there is no evidence in the Jurassic, there have indeed been dinosaur coprolites containing angiosperms from the Cretaceous. We even have grass in coprolites from the Maastrichtian. While it is true that angiosperms did not seem to radiate and become abundant until the mid-Cretaceous, there is well-documented evidence since the beginning of the Cretaceous and possibly as far back as the Triassic if the fossils reported by Hochuli and Feist-Burkhardt last October are true. Thus, it would seem unlikely that dinosaurs waited until the very end of the Cretaceous to eat them, especially considering the prodigious dental batteries seen in the hadrosaurs. There is also the small problem of taphonomic bias in that herbivore feces does not preserve as well as carnivore feces due to the rich nutrient source in the carnivore feces feeding the bacteria which mineralize the feces, making herbivore coprolites rarer and ranges thus more uncertain. A correction? Please change “flowing plant” to “flowering plant” underneath the first picture. Thanks, never cared for those flowing plants. I like the ones that flower so much better. So I just read “Remarkable Creatures” by Tracy Chevalier. It’s an historical fiction novel told from the perspectives of Mary Anning and Elizabeth Philpot. I’d very highly recommend it to you. It has a number of historically accurate controversies over topics like extinction and the existence of an ancient earth put into conversations between main characters. I think you’d really enjoy it. I’m going to write a post on it to be published… at some point in time.